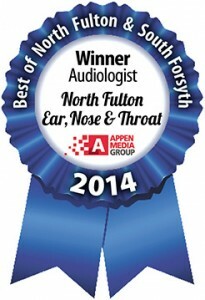 The Audiologists at North Fulton Ear, Nose & Throat Associates are licensed doctors of Audiology who partner directly with our Otolaryngologists to identify and offer solutions to all varieties of hearing issues. Our team of experts evaluates, treat, and rehabilitate patients for the complete range of ear problems, including hearing loss, single-sided deafness, tinnitus and balance. For more information about hearing loss or to book an appointment for a hearing evaluation, Contact Us.